You want to look cute, but you also want to be comfortable. Why is it so hard to create an outfit that does both? Looks like Pippa Middleton has a new love, and it’s not James Mathews. Newlyweds Pippa Middleton and James Matthews are positively owning wedding season style. The duo touched down in Europe to attend a friend’s nuptials in Sweden on Saturday after their epic honeymoon abroad. Pippa rocked a floor-length floral gown from Erdem and walked hand-in-hand with her new husband, who wore a tailored tuxedo and classic white bowtie. Pippa really knows how to stand out at a wedding, as evidenced by her infamously poofy bridesmaid dress from the ‘90s (not to mention her other, more famous bridesmaid dress). Since their own ceremony last month, Pippa and James have flaunted their fashion prowess in Sydney, Australia and also holed up on a private island, presumably working on their tans. Clearly, this Middleton can rock any role at a wedding. We can’t wait for the next event! Pippa Middleton has set the vacation wardrobe standard! On Wednesday, Middleton and her hubby climbed the famous Sydney Harbour Bridge at night. The bridge offers 360-degree views of Sydney and stands about 440 feet in the air. The night climb costs around $ 253 – $ 388 for adults and can take up to 3.5 hours to complete. The couple is staying at the Park Hyatt Hotel in Sydney, which offers views of the Sydney Harbour and the Sydney Opera House, according to a press release. Where will they jet off to next? "Live From E!" breaks down Kate Middleton's younger sister's wedding extravaganza! Plus, was the wedding held up for Meghan Markle's arrival? Pippa Middleton is officially a married woman — and she’s added another ring on her left hand. After exchanging her “I Dos” with new husband James Matthews in a private ceremony at St. Mark’s Church in Englefield, England, on Saturday, the 33-year-old new bride proudly showed off her antique Asscher cut engagement ring from English jeweler Robinson Pelham, along with a new addition — her wedding band. While Princess Kate‘s younger sister has a show-stopping engagement ring, it seems she went for an understated gold band that works perfectly with her dramatic diamond ring. The ring is similar to sister Kate’s wedding ring, which is a simple Welsh gold band. British royal brides have been wearing Welsh gold bands as wedding rings for nearly 100 years. Middleton, who arrived at the church with her father, Michael Middleton, was a beautiful bride in a custom silk cotton lace gown by Giles Deacon. RELATED: See Pippa Middleton’s Wedding Dress from All Angles! Her young nephew and niece, Prince George and Princess Charlotte, also joined the wedding party, acting as a page boy and bridesmaid, respectively. Naturally, the stole the show — even if they had to be shushed by mom Kate, who ushered them into the church along with the other children. After getting the children settled, Kate greeted her sister and father at the entrance of the church and helped smooth out her sister’s dress. Guests leaving the party after the wedding told reporters that the ceremony was lovely. “It was amazing,” one guest told PEOPLE. “They were so cute. I cried. My makeup was running.” They added that George and Charlotte were “very” well-behaved. Wedding guests included Princess Eugenie, Prince William and Prince Harry — who later brought his girlfriend Meghan Markle to the post-church evening reception at the Middleton family’s home. Matthews, 41, proposed to Middleton in July 2016 in the picturesque Lake District of northwest England. Matthews manages a hedge fund and is chief executive of Eden Rock Capital Management Group, which he established more than 10 years ago. The best part of a royal wedding: hats. We imagine that a parade of the world’s best hats looked similar to guests walking into Pippa Middleton’s wedding to James Matthews…. Where Was Meghan Markle at Pippa Middleton’s Wedding? Update at 1:13 p.m. PT: Meghan Markle was spotted at Pippa Middleton and James Matthews’ wedding reception later in the day. In a twist that should shock no one, all eyes were on Prince George and Princess Charlotte at their aunt Pippa Middleton’s wedding Saturday. Prince William’s sister-in-law looked absolutely stunning in a a high neck, lace Giles Deacon gown with a long train and bespoke veil, but his tiny children gave her a run for her money doing their duties as page boy and bridesmaid. Charlotte looked adorable in a white short-sleeved dress with a big pink bow and floral head piece. George, who is getting bigger every day, looked oh-so-dapper in a white collared shirt and short trousers. 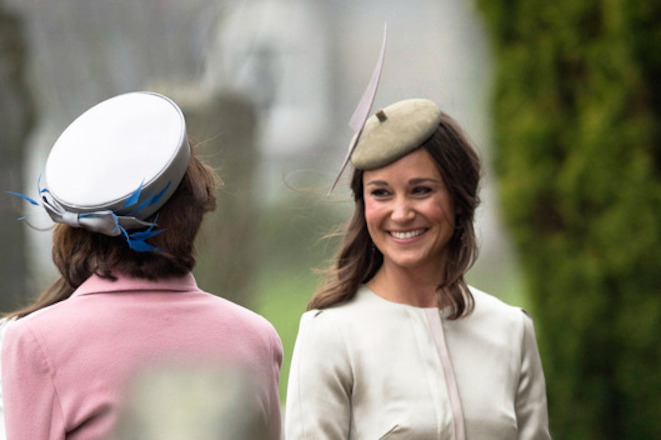 The former Kate Middleton, who looked beautiful in a long-sleeved, pale pink dress with a matching fascinator, reportedly expressed some concern on Tuesday over how her little ones would behave during the nuptials. From the looks of it, though, all they did was manage to look even cuter than usual. Perhaps they’ll be reprising these roles for Prince Harry and Meghan Markle’s wedding next? We can only dream. Pippa Middleton and James Matthews’ wedding finally arrived, and it more than lived up to expectations. The May 20 affair at St. Mark’s Church in Englefield, England had everything a royal enthusiast could dream of: Prince George as a page boy, Princess Charlotte in a giant bow, the Duchess of Cambridge in pale pink and of course, the bride in a stunning classic, high-necked Giles Deacon gown. It was the picture of perfection, and we’ve got the pictures to prove it. Check out the festivities below, and join us in fantasizing about actually being there for the rest of the day. CORRECTION: Princess Eugenie was misidentified as Princess Beatrice of York in an earlier version of this article. Who and what to expect during the weekend event. Not just another Pippa Middleton title. This book is your ultimate resource for Pippa Middleton. Here you will find the most up-to-date 35 Success Facts, Information, and much more. In easy to read chapters, with extensive references and links to get you to know all there is to know about Pippa Middleton’s Early life, Career and Personal life right away. A quick look inside: Kate Middleton – Early life, Wedding of Prince William and Catherine Middleton, Catherine, Duchess of Cambridge, James William Middleton – Personal life, Peter Francis Middleton, Pippa Middleton, E! True Hollywood Story – Couples and families, Karl Lagerfeld – Controversies, Thomas Davis (clergyman) – Life, Bradfield Southend – Notable residents, George Percy, Earl Percy, Barbara Walters’ 10 Most Fascinating People – 2011, Concert for Diana – Attendees, Michael Middleton – Television and film portrayals, Michael Middleton – Parents, James William Middleton – Other Royal events, Michael Middleton – Children, Guy Innes-Ker, 10th Duke of Roxburghe – Children, Bikram Yoga – Notable practitioners, Engagement announcement dress of Catherine Middleton – Background, Carole Middleton, Valerie Glassborow, Royal Berkshire Hospital – History, List of wedding guests of Prince William and Catherine Middleton – Relatives of the bride, Pippa Middleton – Early life, Family of Catherine, Duchess of Cambridge, Wedding of Prince William of Wales and Kate Middleton, Sarah Burton – Fashion career, St Andrew’s School, Pangbourne – Notable former pupils, List of wedding guests of Prince William and Catherine Middleton – Maid of Honour and Best man, and much more. Pippa Middleton Goes Out on Her Own. But She’s Not Alone. The sister of Britain’s future queen makes a match that the often-critical British press seems to approve of. Pippa, you have a sail on your head. Or a fin. Something. If you haven’t been made aware, Pippa Middleton, lover of hats, and the sister made famous for being a sister, occasionally writes an opinion-slash-advice column for Vanity Fair. Yes that Vanity Fair. Her stories, which are all a bungling collection of fancy words, lack any creative intelligence. For that reason alone they are all must-reads and quite frankly should be required reading for any pursuer of any language degree. Each story has the unique combination of a “what don’t you get about what I’m saying” tone, coupled with an airy pretentiousness one might expect from the sister of a future Queen. The only negative, really, is that she’s only written a handful of stories– which is truly a shame. Last year, for instance, she dedicated 340 words to Royal Ascot Week, so you can imagine my euphoria when a notification popped up in my email that she had published a guide on croquet. I immediately thought, “OH CROQUETTS! YUM! But then realized it wasn’t to be. Turns out that a guide on croquet was even better because it made me think: How have we gotten through life without the definitive guide on crochet– sorry, croquet. For no other reason but that it’s comedy gold, I’ll be reviewing Pippa’s “Guide to Croquet.” Right here. Right now. Just for you. Ah yes… remember those days, folks? A spot of tea. A biscuit. Young Remy doffing his cap. THOSE WERE THE DAYS! Did you heathens and masochists know that croquet “is an English game through and through?” ‘Cause it is (angry face). “It’s also very popular at BOTH Oxford and Cambridge!” I know because Pippa just told me. So whenever you lads are walking around the quads at Cambridge, don’t act surprised when a mean game of croquet breaks out. Pippa then lays out the rules of croquet– literally. She basically and probably just went to Wikipedia or something. That really doesn’t require any work, but whatever. I won’t judge. Except that I kind of am. Oh well. Did you know there are copious famous fans of cricket croquet? Winston Churchill, and Clooney, just to name a few. 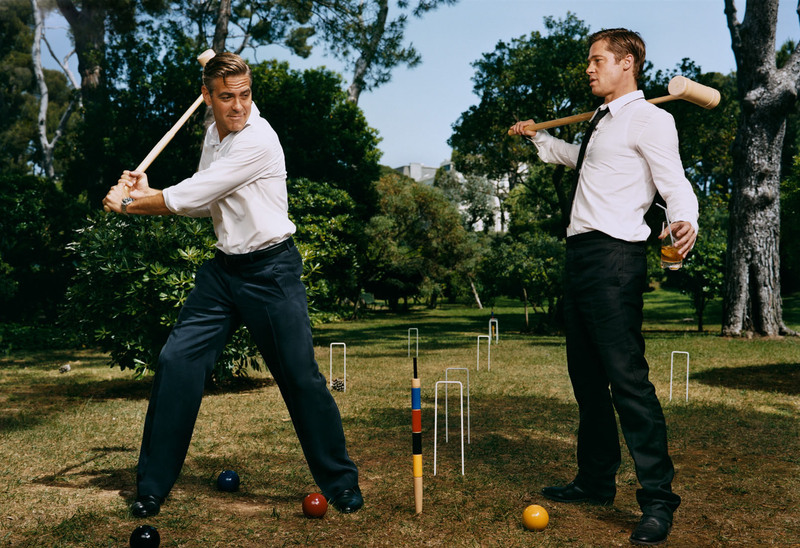 Honestly, if you told me that was Clooney and Brad playing cricket and not croquet, I’d have said, “Okay. Ya.” So call me uncivilized. She also mentions Diddy as one of these “famous fans,” but calls him Sean “Puffy” Combs, which he hasn’t been called since 2001. So, I mean come on, Pippa. It’s a wonderful tale of sport and leisure on the English countryside. Really. If all of this talk about croquet excites you and you’re just chomping at the bit to get started, just buy a mallet. You can buy one for $ 666.00— the Devil’s sign. Chris Peak is a freelance writer from Boston. He blogs at Huffington Post, and has contributed to Gawker, GOOD Magazine, Deadspin, and Point Magazine.